........ Did you know there are more than two types of potato? Often when you go to the shops there is a choice of two, red or white. Did you know that the potato came from South America? Did you know there are over 300 varieties listed in the UK and there are many more elsewhere? Seed potatoes of over 100 varieties are available commercially in the UK. We grow two varieties on a no-dig bed under polythene, and then twenty varieties in pots. Two or three tubers are placed at the bottom of a bucket with holes drilled in the bottom, and compost is added as the potatoes shoot. Yield is about 1.5lb per pot. Not enormous, but allows us to try diverse varieties. Click here to find more details of our experiences of growing potatoes in pots, and the cooking properties of different varieties. Cooking quality ranges from very floury, such as British Queen or Kerrs Pink which make excellent mashed potato to very dry, such as Golden Wonder, which are good for slicing and frying in olive oil. 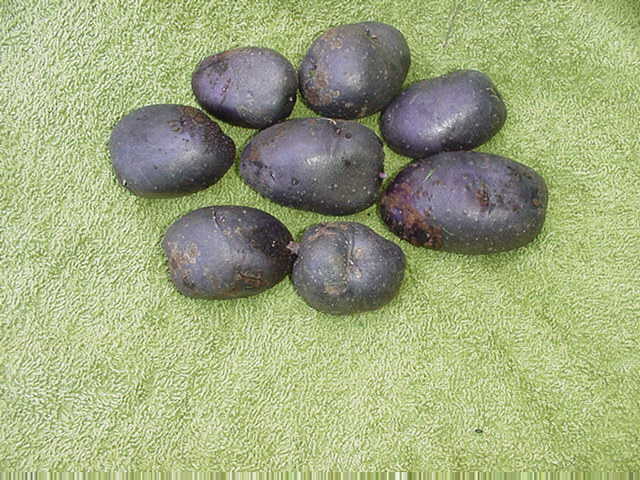 Waxy potatoes, such as Charlotte are ideal salad potatoes and excellent cold. We get our tubers for the pots from the HDRA potato day in February. We have been fascinated by the different colours of the flowers and tubers of potatoes. We have been taking photos of these this year. Here is an example of the Blue salad potato flower and tuber for you to see. This potato has blue flesh! Ideal for Halloween. If you want to see more photos of potato flowers, then click this link. We have photographed about 40 varieties so far. Numerous photographs of potato tubers are shown here. Click on the small images to see the detail. It is important to keep the different varieties growing to maintain genetic diversity. The European and Irish potato famines were caused by over-reliance on a very small number of potato varieties which were susceptible to blight. Genetic diversity is necessary so that disasters like this do not happen again. It is also necessary to maintain a varied genetic stock so that useful new varieties can be developed in the future. A variety with an poor flavour might have excellent blight resistance, for example - and might be used in breeding programmes.